Making your home more visually appealing does not have to be expensive as there are simple and fabulous ideas that can be used to enhance the general outlook of a home. The use Photo frames just like other features used for home decor can be incorporated with some creative ideas for a more visually appealing home decor. There are various simple, creative ideas shared here that one can take advantage of and use with photo frames for a more exciting and elegant home. 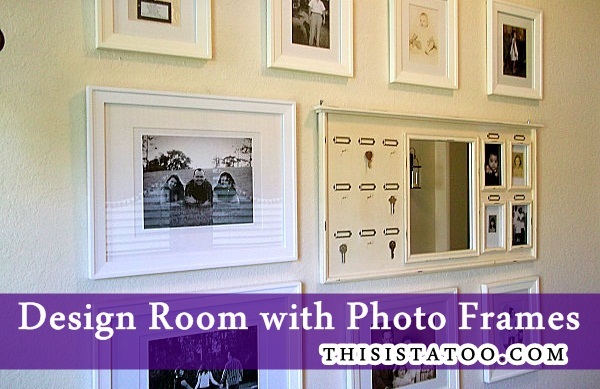 Photo frames have a unique ability to change the entire outlook of a room. In addition, you will be able to share your memories as well as your esteemed moments with your friends, family, relatives, or the visitors. Hence, it is the best and effective way to décor a room with your memories and makes it different from other.There are several ideas that one can draw from to be able to design rooms with the use of photo frames. The ideas shared here are inspiring with ability to transform the style and outlook of your home. Frames in most ways blends well with any design used in any room with the frame photos enhancing the appearance of the room. 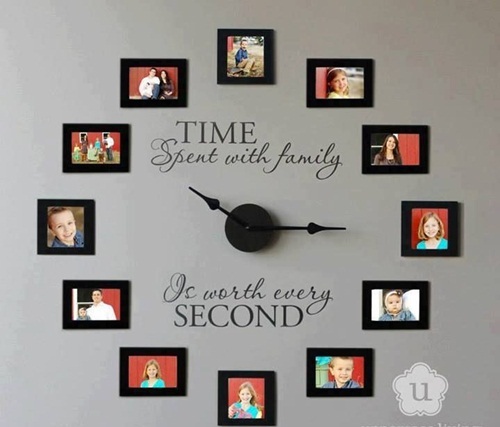 If you are living far from your family or missing your beloved ones, then it is a perfect way to keep your family, friends, or beloved ones closer by decorating the room with their picture. Having pictures frames of your loved ones creates a constant reminder of thinking of them and remembering how important they are to you. 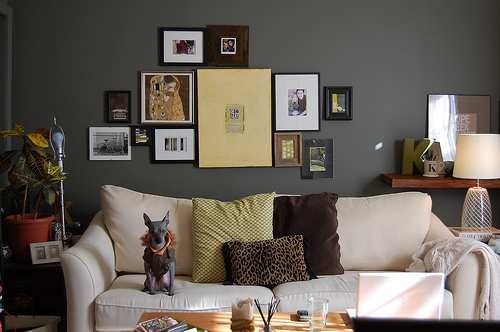 The display of photo frames in the design below blends quite well with the grey accent in the room. The black and white themes in the photo frames enhance the look of the wall and combines perfectly with the accent of the room creating an atmosphere that’s lively and engaging in the room. Old pictures have a way of igniting some refreshing feeling giving you the motivation to live more happy life. You can relive your unforgettable memories again and again by looking at the photos. 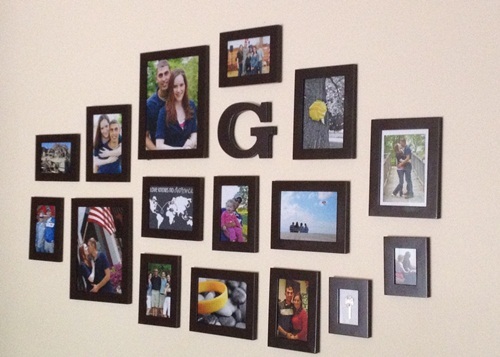 Hang your unforgettable memories on every wall of your room. With the photo frames, you can also use artificial flowers to design an interior garden; it will give a different look to the room. Whatever you chose, just select it according to your personality, so you can feel the place just like your home. 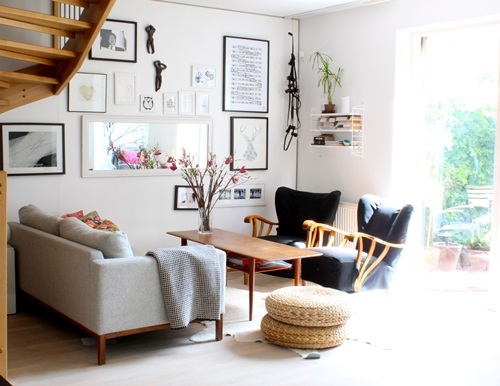 It’s just amazing how photo frames can transform the overall outlook of a room just like the room below. The photo frames with much black theme blends well with striking white wall colours and real expression of elegance, making the perfect demonstration of artwork and design used in the home to pop effortlessly. With photo frames, you can celebrate your memories regularly. There are several kinds of frames that are are available in the market with some large and small as well as in several designs and colors, so you can frame your small or big, all special moments, beautiful art, and your cherished memories using the perfect photo frame. 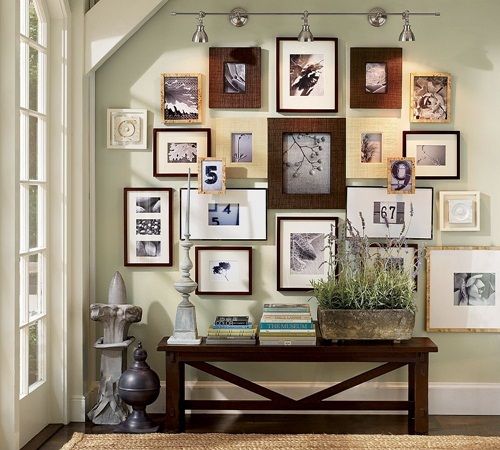 The way photo frames are arranged in a room also adds to the general design of the room. The layout of the photo frames in the room design below with the great balance of frame sizes creates a harmonious flow in the entire room making the whole room look stunning. The colour of the frames blends quite well with the white, black and brown accent in the room creating such a spectacular look. If you are keeping the pictures in cupboard or any other place, then after some time it will be discoloured, but if you use the photo frames then your memories will remain exactly the same. 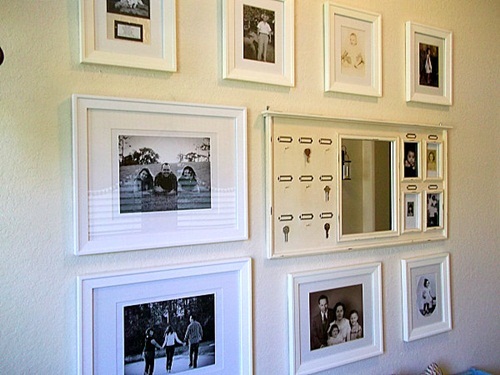 The below arrangement of photo frames looks stylish and beautiful. Using photo frames to showcase your photos and artwork does not require such a big space, you can showcase photo frames of different sizes and shapes to create an eye-catching look. You can also create complexity by allowing an organic mix and match of the photo frames and artwork just like in the design below. In designing your room with picture frames, its good to have a central theme then you can assemble a variety of photo frames and arts around the central theme to create a collage effect. Just like in the design below the big cream frame is the central theme that blends well with other photo frames. The photo frames enhances the dark wall colour and blends well with the seat and other items in the room creating such a spectacular design. 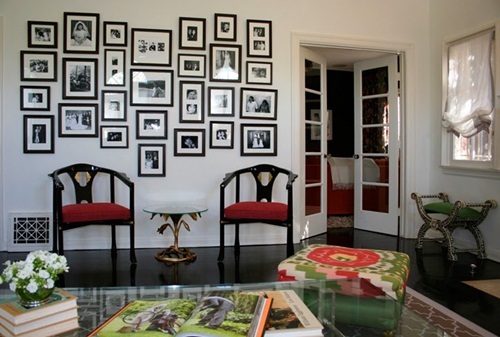 The way the photo frames are arranged can also have a great impact on the room’s design. 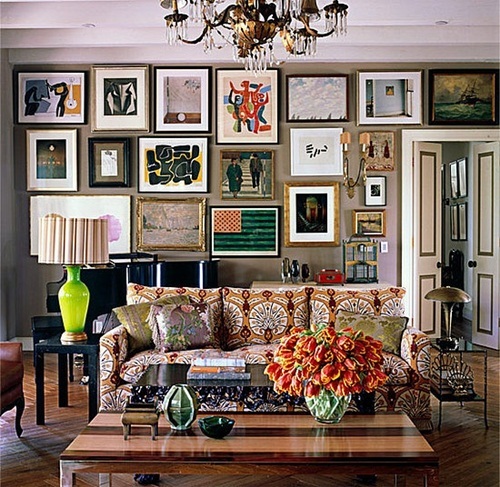 It’s possible to create that eclectic feeling of an art gallery by arranging photo frames of your photos and pieces of art that you love. The design below shows a perfect arrangement of photo frames creating a mix of arts and photo frames that are quite appealing to the eyes. 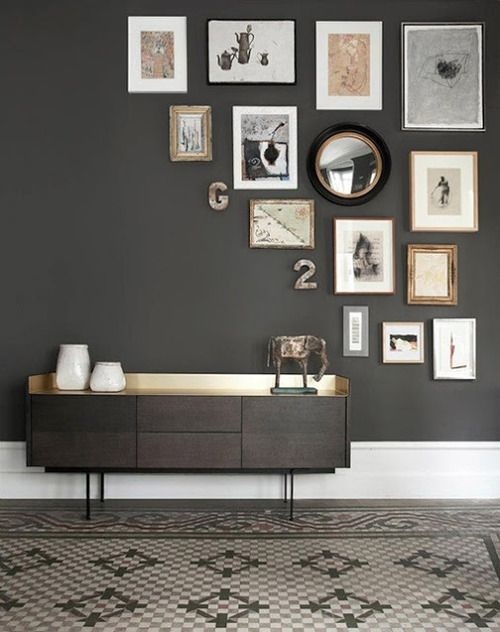 The accent of the wall with the colour of the frames creates such a beautiful blend. For decorating your room, you don’t have to spend lots of time and money because it is a simple way to make your room beautiful as well as it is the cheapest way to decorate. There are several ways to décor your room, you can either go the expensive way by using interior decor experts or use the photo frames as they are the cheapest and antique way to décor your room in low budget. Use of photo frames that are of different sizes and shapes creates such a stylish and an attractive look just like in the design below. The different colours of the photo frames and sizes blends well with the colour of the wall and the entire room, making the whole design eye-catching and beautiful. If you are looking for the cheap frames, then there are several kinds of frames that are available, which deliver the classy and elegant look as well as it also looks expensive. Having a frame that’s larger in the middle is more appealing and creates more attention on the photos and the entire design. The arrangement of the photo frames in the design below is quite stylish with the frame colours blending quite well with the wall colour. 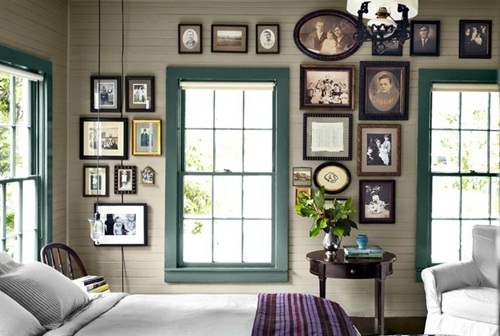 Use of uniform frames with a similar theme connects well with other features just like in the room design below, the colour of the photo frames blends well with the theme of the room. 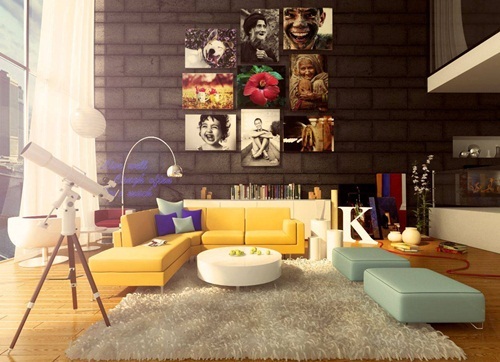 Regardless of the type of photo frames used and the design of room, there should be some connection between the photo frames, the wall colour and the items in the room for there to be some element of style and elegance. The uniform photo frame sizes used on the wall creates such a symmetric flow of the pictures with the photo frames colours blending well with the white accent of the room. Before initiating the work, you should have to collect all your pictures together. You require a few things, such as frames, pictures, pencil, hanging wire, hammer, and some wall screws. You can use some pattern to hang the pictures. If you are placing a group picture and which is too large to display at one time, then you can rotate it seasonally. 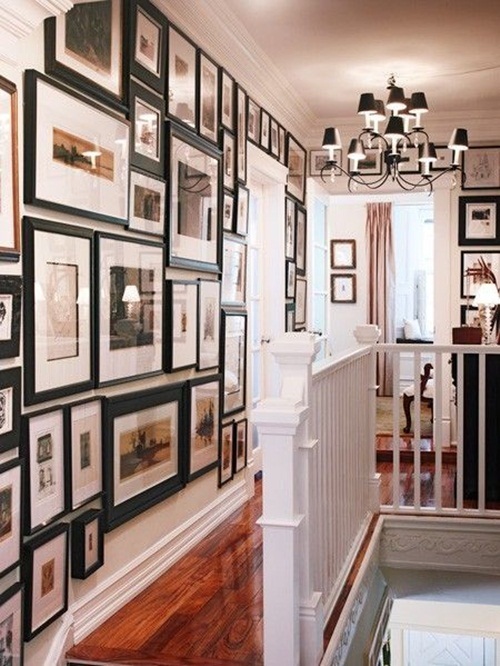 Must remember the layout of your room, and then make some pattern of your hanging pictures. See the different-different angles of the picture (for delivering the perfect and attractive look). 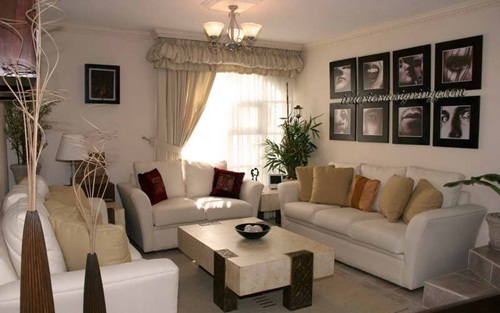 Make the pictures suitable with the furniture in a room. Use of photographs with completely different themes also creates interest in the room though there should be some connection between the scenes depicted. 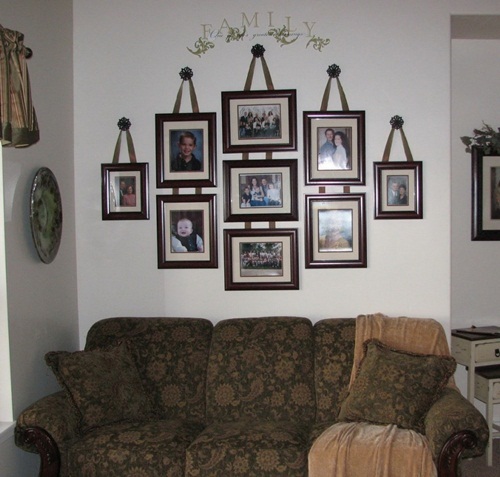 Just like in the photo frames below every photo is different with each depicting a different story for the family and the colour of the photo frames blends well with the wall. Photo frames can also be used in the bedroom as they help in making the room inspiring and full of nice memories. 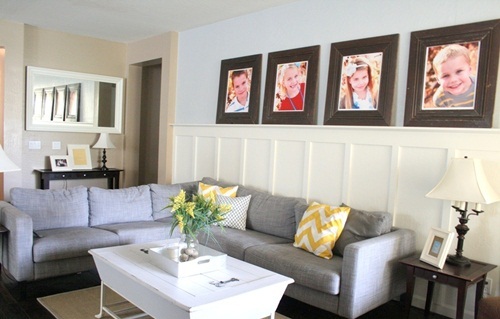 Family pictures can be showcased in a perfect design that blends well with the theme of the room. 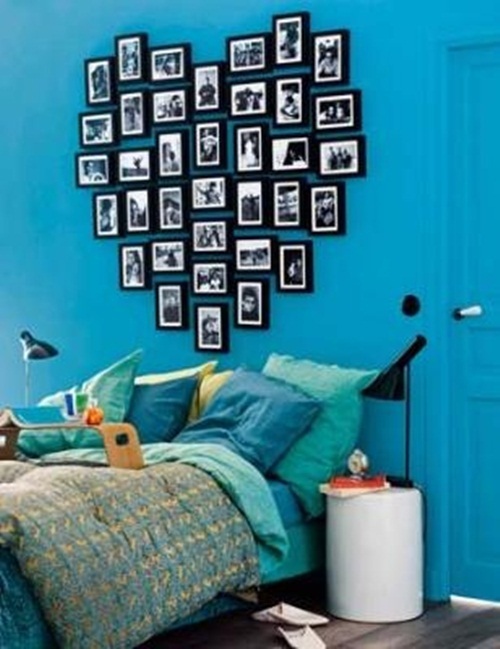 The design below shows an array of photo frames arranged in a perfect design just slightly above the bed. The black and white theme of the frames connects well with the blue accent of the room. 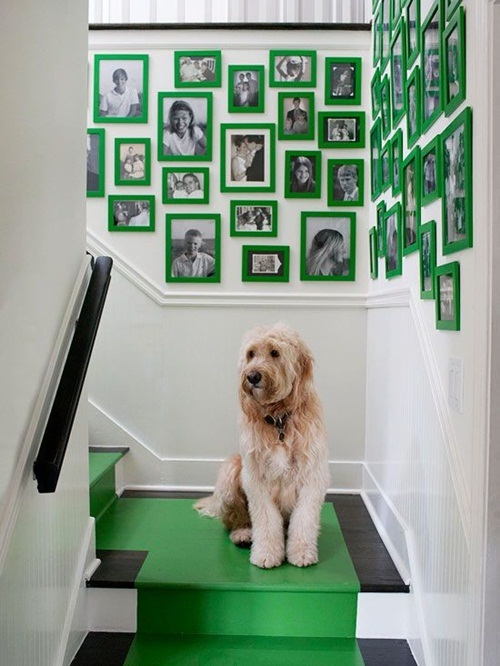 Displaying family photo frames along the staircase creates a unique design in the room. The ascending steps of the staircase just like in the design looks quite stylish and attractive. The colour of the photo frames connects with the colour of the floor and blends well with the theme of the room making it look fascinating and cool. There are many photo frames arrangement designs that one can choose from however just coming up with your own simple ideas can create such an extraordinary and unique design. The photo frame design below is one unique design with the centre pictures creating a focal point that enhances the entire look of the design. The most important thing that you must have to remember while decorating the home or room is fun. You can alter the position of photos in a certain period of time. Hence, decorating the room with picture frames is one of an easiest and simplest way to accent your room in a perfect and personal manner. 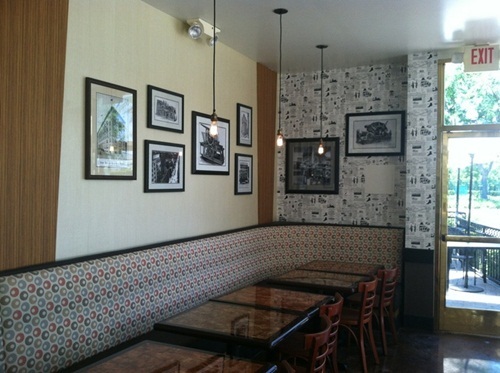 Another design that looks great is having the photos pinned on a big sheet of paper then hanged on the wall. The paper used enhances the appearance of the photo frames and creates quite an attractive look when the colour connects with some of the items in the room. Use of different shapes of frame and sizes works quite well when the arrangement is balanced like in the design below. Displaying photo frames on the open spaces in the rooms also makes the house to look quite engaging and inspiring like an art gallery. The different types of frames used in the design below and the different sizes and shapes bring out a collection of memorable pictures that can be quite inspiring and memorable to the family. Use of mixed pictures in such a space is quite ideal. The uniform size of the photo frames makes a great room design even as they are arranged just slightly below the ceiling. The blue colour of the photo frames blends perfectly well with the white accent and the blue theme of the room. 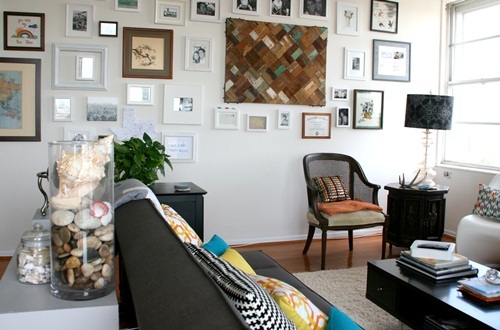 The wall below looks great with the cohesive collections of beautiful images that are well framed. 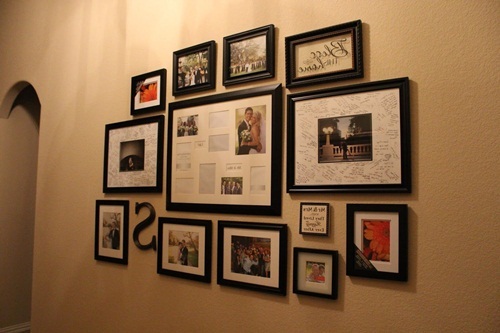 The different types of frames used and the space between the photo frames creates attraction to each photo frame individually. Framing of photos and artwork grants each photo room for expression as in the room design below.